Tracfone offers a growing selection of smartphones to use with their prepaid cell service, including Apple iPhones, high end smartphones (Samsung Galaxy S6, S7), and many budget smartphones. But consumers can also choose to purchase their own unlocked phone to bring to Tracfone's BYOP program. But many consumers who want to buy their own phone, have certain questions. What's the best phone to bring to Tracfone's BYOP (Bring Your Own Phone) program? Are there any phones besides the Smartphones from Tracfone that I can use with Tracfone prepaid service? What phone should I buy as a Christmas present for my family member or friend? These are all good questions, and we will help answer them, and more, in this list of the best unlocked smartphones that can be used with Tracfone prepaid service. Tracfone's BYOP program allows consumers to find their own smartphone, and then activate it with Tracfone's prepaid service. It is a very convenient way to get to choose whatever phone you want, while keeping Tracfone's low cost service plans. But not everyone knows all the best options, so we are here to share our top picks for phones to bring to the BYOP program. For specific details on the requirements for activating a phone with Tracfone, see our Guide to Transferring/Activating a Smartphone with Tracfone or visit our Tracfone BYOP page (which also has a large list of phone options). We are choosing these phones based on a variety of factors including popularity, value and cost. These are some of our best suggestions of phones we believe will fit most user's needs. In the end, each person needs to understand what they want out of a phone, and choose a phone according to that. 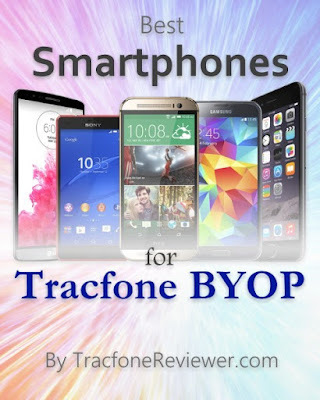 Most Tracfone users decide to use BYOP because they want a phone with a little more power and performance compared to most Tracfone smartphones, plus a wider selection of devices. In our list, we only include phones priced between $100-$400 as the majority of our readers are looking for a phone in that price range. Now let's take a look at the list! Below are the six best phones (and a few others) to use with Tracfone based on several factors. We hope this list will act as a guide and suggestion, and allow you to choose which phone best fits your needs. The Moto G6 is the sixth and latest generation of a well-rounded line of phones that offer great value at a reasonable price. The Moto G line has long been known as the 'budget king' because of the terrific balance in price and specs, with the G6 maintaining that title. The G6 has a large, 5.7" full HD touchscreen, 1.8Ghz Octa-core processor, 3 GB RAM, 32 GB Storage and dual rear cameras. It also features the latest Android OS, 8.0 Oreo and is compatible with both GSM and CDMA networks. For more details, view our recent Moto G6 specs and features list. If you want to save a little money, and don't quite need the performance of the G6 but want a larger battery, the G6 Play is the answer, with a 4000 mAh battery for all day performance. The G6 Play has many of the same features, including Android 8.0 Oreo, 3 GB RAM and 32 GB storage, plus a 13MP rear camera (but not dual rear camera). The G6 Plus features more RAM, Storage, and a larger screen but is only compatible with GSM networks. One of the main reasons many Tracfone users started switching to the BYOP program was to use an Apple iPhone with Tracfone service. Recently Tracfone has also started offering several iPhones including the SE, 6 and 6 Plus and even the iPhone 7 (Visit our Latest Tracfone Smartphone List to see exactly what's new). But it is still generally cheaper to find an unlocked iPhone such as the SE and use it with BYOP. The iPhone SE is a compact device with impressive internal performance. It features a small, 4" retna display, and internal specs inline with the iPhone 6S, including A9 processor, 12MP rear camera with 4K video, and up to 64GB storage. Look for the iPhone SE in some retail stores, but also online through Amazon or eBay. Make sure you choose an unlocked version that is compatible with the service in your area. Built from a single block of aluminium, the Nokia 6.1 is made to be stylish and durable with Corning Gorilla Glass on the 5.5" full HD touchscreen. It also features 3 GB RAM, 32 GB Storage, a 16 MP rear camera and runs Android One. For those who are unfamiliar with Android One, it is a pure version of the Android operating system with no additional apps or clutter. It is both a hardware and software technical standard from Google designed to give users a consistent experience. The Nokia 6.1 is a great looking phone but also a little more expensive than some of the options here. With a 5.1" full HD touchscreen, 16 MP camera, 2 GB RAM and Quad-core processor, the Galaxy S5 packs good performance despite the fact it was released a few years ago. It runs on Android 4.4, but is upgradable to 5.1, and even 6.0 in some cases. When it was released in 2014, the Galaxy S5 was the flagship phone for Samsung, packing in the latest and greatest performance and features that make it relevant even today. Why we include it in this list is that this phone can be found for around $100, and even less if you're willing to buy a refurbished model. That's a bargain for a phone that can shoot 4K video at 30fps, and much more. Featuring a 5.5" full HD IPS screen with 18:9 ratio the LG Q6 is the budget friendly version of the LG G6 and comes with many of the sleek design elements. It also has passed many durability standards, thanks in part to metal sides. Internally the performance of the LG Q6 is good with 3 GB RAM, 32 GB storage, a 13MP camera and a 1.4 Ghz octa-core processor. The phone runs Android 7.1 and is compatible with GSM networks. The LG Q6 compares closely to the Moto G6 Play, with each phone offering certain pro's and con's. Looking for that sleek, high-end feel? Consider the Honor 7x which comes with an all metal shell for protection and appearance and edge to edge 5.9" screen with 18:9 ratio. Inside it houses dual rear cameras (16MP and 2MP), 3 GB RAM, 32 GB storage and uses GSM networks. Another great feature on the Honor 7x is the fingerprint sensor (also available on the Moto G6) which allows you to securely lock the phone, and quickly unlock it. All of this is available for under $200, making it another great option. That concludes our list of the the best budget friendly smartphones to use with Tracfone. We hope this list serves to provide some ideas of different phones available to use with Tracfone BYOP. We want to hear from you! Share your current/favorite phone you use with Tracfone in the comments below! Also join in on the discussion on our Facebook page where more than 2000 followers already get the latest news and information in their feed. Don't miss out on our monthly list of Tracfone Deals, Discounts and Sales which also include unlocked phones and Tracfone smartphones. Also take a look at our recent Cell Phone Reviews which lists all our reviews in one convenient place. And if you need some info on activating or switching your phone to Tracfone, read our full Guide to Activating or Transferring to a Tracfone Smartphone. 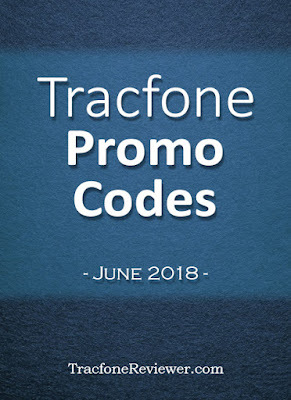 Welcome to TracfoneReviewer - we share news, reviews and promo codes! 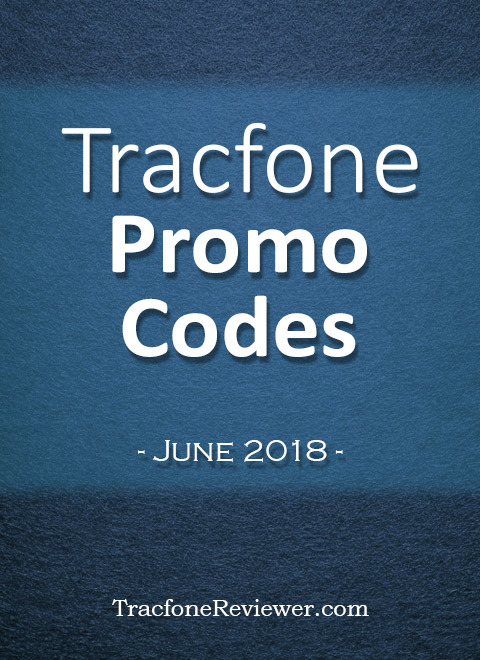 Summer is here and father's day is also around the corner and with that we also have new Tracfone Promo Codes for use with Tracfone airtime cards. Each month we update and share the latest promotional codes to use with Tracfone. These codes give free bonus minutes when adding airtime to your phone. Tracfone promo codes are available for both regular and smartphone only cards. To use a promo code simply find a code for the airtime card you have (or buy an airtime card that has a code below), enter the promo code when adding the airtime (either online, on your phone or over the phone) and receive your bonus airtime. Note that some promo codes may be one time use or have other limitations. Learn 4 Ways to Check Your Airtime Balance with Tracfone to keep track of when you need to add more minutes. And also be sure to visit our Latest Tracfone Smartphone List for the newest phones available from Tracfone. Now let's get to the list of codes. Each code is for a specific airtime card but may also be used with cards of higher value (for example, the code for a 120 minute card can also be used with the 200 and 450 minute cards). That concludes our list of codes for June 2018! Please let us know in the comments which code you tried and how it worked! Also share any codes you find! If you are looking for a new phone with a little more performance than what Tracfone offers check out our recent posts on the Moto G6 and Moto E5 Plus. We share news and specs for these phones that can be used with the Tracfone BYOP program. See the best deals on Tracfone devices with our monthly list including great airtime bundles! Lastly, join us on Facebook if you haven't already, with almost 3000 in our community where we share the latest posts, news and help answer questions.